“Fukushima Is Here”: Nuclear Radiation On the West Coast, from California to Alaska. An interesting fact for people living on the US west coast is also included in the UNSCEAR [United Nations Scientific Committee on the Effects of Atomic Radiation] report: only about 5% of the directly discharged radiation was deposited within a radius of 80 km from the Fukushima Dai-ichi nuclear power station. The rest was distributed in the Pacific Ocean. 3-D simulations have been carried out for the Pacific basin, showing that within 5–6 years, the emissions would reach the North American coastline, with uncertain consequences for food safety and health of the local population. 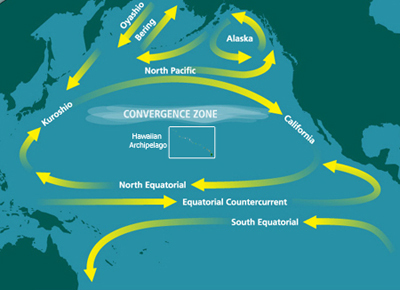 The University of Hawaii’s International Pacific Research Center created a graphic showing the projected dispersion of debris from Japan. 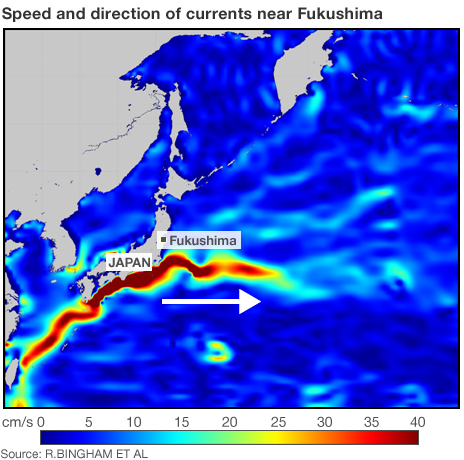 Bluefin tuna on the California shore tested positive for radiation from Fukushima, and there are reports of highly radioactive fish in Canada.